We offer a great selection of instant prize to choose from. To learn more visit the manufacturer websites below. The Pirates Chest Â® is based on our very popular Toy Chest Â® cranes, but has a great pirate themed decal package. 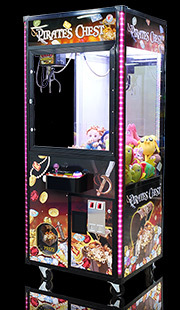 This pirate treasure theme works well with many types of prizes like candy, plush, jewelry, and more! Add Smart's Jewelry Crane option and you'll have what many consider the most attractive jewelry crane in the industry. Kids will be drawn from all around to this bright, attractive crane. From the candy rope lights and light-up roof to the big lollipop on top, this crane will keep them coming back over and over again. 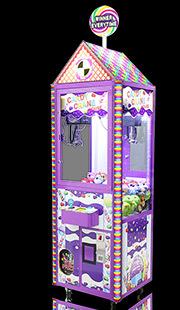 Perfect as a "winner every time" crane. Fits through standard doorways with roof attached, and fits under standard 8â€™ ceilings with lollipop topper added. Smart introduced our first crane that features a DUCK theme. 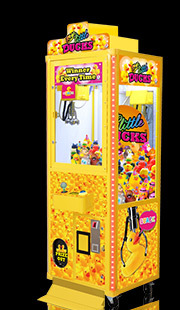 The game, called "My Little Ducks", comes in a 24 x 24 inch cabinet and features a delightful rubber duck themed graphics package and a lower front anti-tip plate. Add illuminated brilliance to your location with our new Ticket TimeTM CRANE. This exciting new crane features fully lit front panels with colors cast by LED's. Choose the colors that best fit your location and add elegance and attraction to your crane. Players attempt to win ticket rolls in various values. 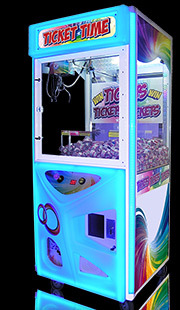 The rolls can be redeemed at the redemption counter where tickets or swipe cards are used. 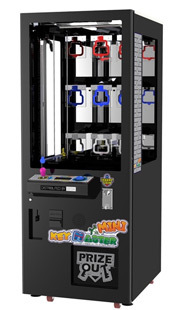 In swipe card locations the attendent will credit the players card with the value of tickets won. In all locations the rolls are then recycled back into the game. Come one, come all! 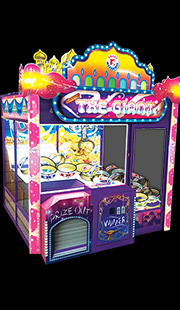 Incorporating authentic carnival-themed graphics and sounds, Balloon Buster recreates that fun atmosphere found at the carnival for all players to enjoy. This attractively themed prize merchandiser has nostalgic appeal for all audiences ensuring it's hard to walk past without giving it a try. 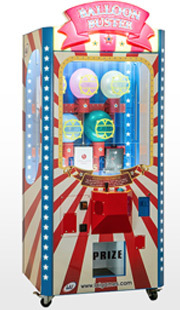 To win players guide a long metal dart through the hole and pop a balloon and win the prize. Simple, quick game play encourages repeat attempts.